- FREE Standard Shipping World Wide. - 925 sterling silver with zircons. - 18 carat gold plated on 925 sterling silver with zircons. - A pair of equal earrings, one for each ear. - You can wear them in different ways. - 1 year warranty on proper use. 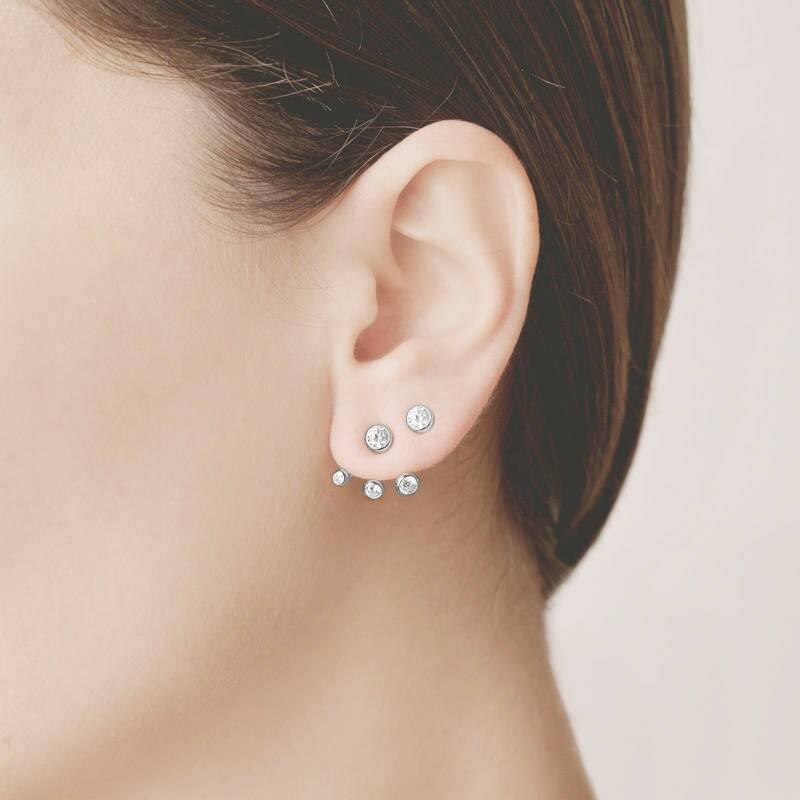 - If you have two piercings in one ear, you can create a singular look by putting the regular earring on the bottom and just the stud earring on the upper piercing like in the picture. - These dainty earrings are composed by a bright zircon joint to a three branch piece that you wear at the back of your earlobe. In that way the branch piece is hidden and you only show the three brilliants. 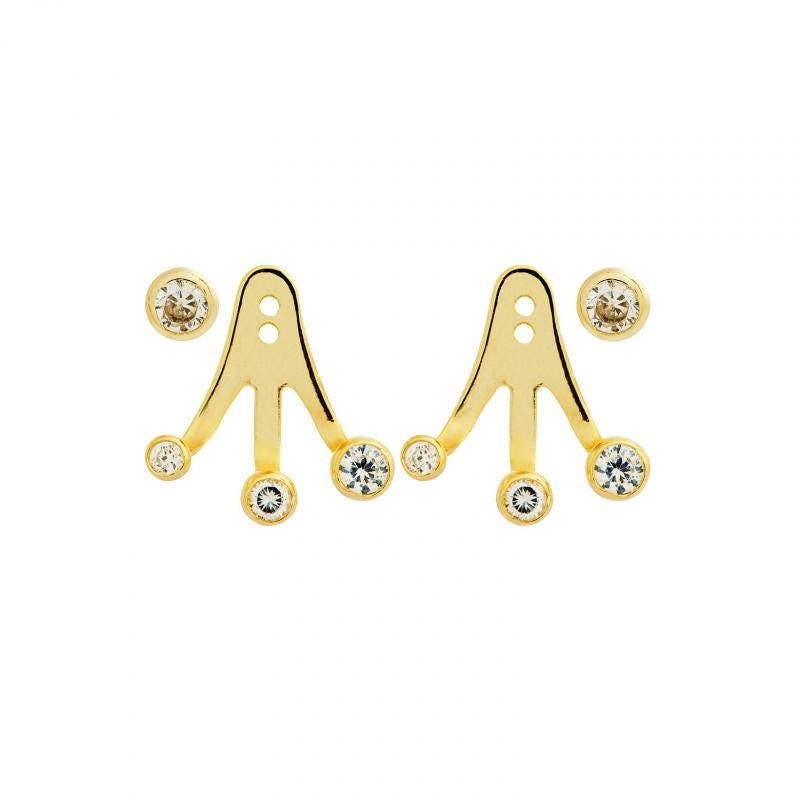 - Wear the latest trend with these Gold front back earrings. - These are a designer earrings in Ear Jacket style. - Ideal for matching to minimalist looks and formal outfits. - These ear jacket earrings have 3 small zircons in rounded shape in the down side of the earlobe which produces a trendy and original effect. 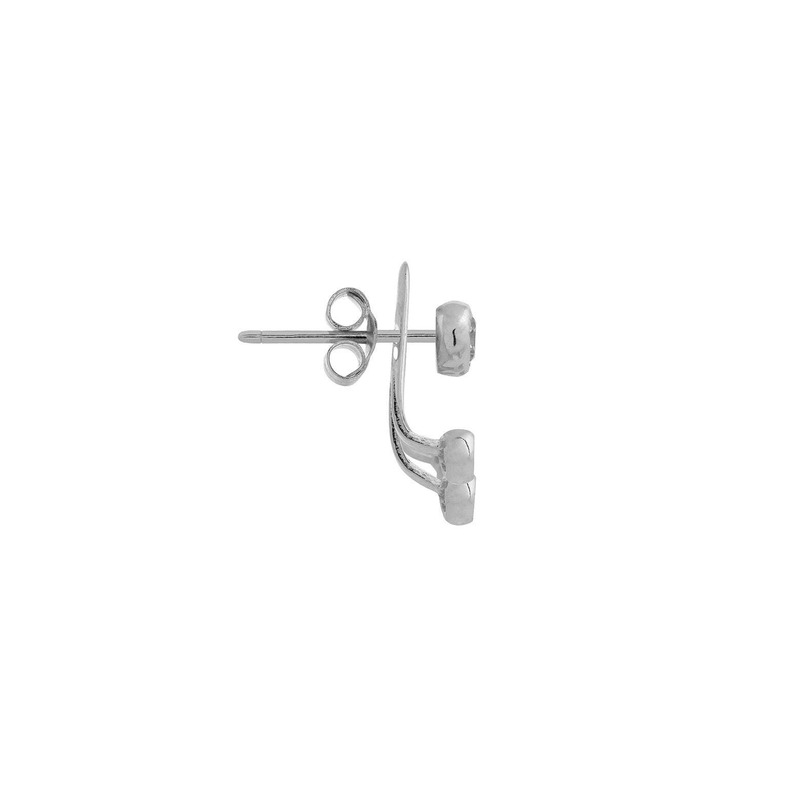 - Join to the minimal trend with these designer earrings in Ear Jacket style. They are already a must for lots of celebrities. - Check the price for other countries in your shopping cart when checking out (drop down menu). IMPORTANT: PHONE NUMBER is required for FAST SHIPPING. (Leave me a note with your phone number before paying). IF YOU WANT TO WRAP the jewel with an amazing gift paper, you simply have to check the box indicated at the time of payment. All jewels are sent with a special and beautiful hard packaging box which prevent the product to be damaged. Each jewel is sent in a packaging that prevents the jewel moving by itself or opening. Buy with confidence. ¿WHERE to store my jewels? Store each piece in a tiny and absolutely well closed plastic bag, this is good due to the limited exposure of the silver to the air. - Keep them away from humidity areas. ¿HOW and WHEN to clean my jewels? - Only clean your jewels if they need to and use a special cloth. - Rub the jewel with the cloth until it shines again. 1st time: a minimum order of 350$ is required as well as the VAT number. In wholesaler we do not accept refunds but yes exchanges. (unless the item you receive is not what you ordered or is damaged). We carefully check all items before shipping. I have some items which are available for personalizing. - In the product description is explained how to proceed. - Normally you let me know at the moment of paying how you wish to personalize it. - In some other items you will see the custom option while adding the product to your shopping cart. - Rings are measured in US size. - At the last picture of each ring product there is the conversion chart. 1- Take one of your rings and measure the inner diameter without taking into account the band thickness. If you have doubts, send me a conversation and I quickly answer you. 1- The address provided was not correct. 2- If the package once attempted to be delivered is unclaimed. We do not offer a refund but yes the possibility to have the package reshipped once the package is sent back to us. You will need to pay a re-shipping cost before sending the package again. - In case you are in a rush to receive your item you can do a new purchase (product + shipping) before we receive back your first package, and once it is back to us we refund you the money of the product. ¿What happens if I introduced my address wrong? - It is clients responsibility providing the right address before the purchase is finished. - Notice that we ship all orders very fast and it makes difficult an address change. - But send us a conversation with your right address and we will do our best. - Please check carefully the address before finishing your purchase.